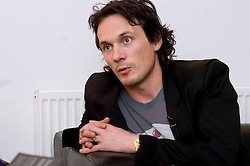 Richard Reed Co Founder of Innocent which was founded by three Cambridge graduates - Richard Reed, Adam Balon and Jon Wright; at the time they were working in consulting and advertising. The three were friends at St John's College, Cambridge. In 1998, after spending six months working on smoothie recipes and £500 on fruit, the trio sold their drinks from a stall at a music festival in London. People were asked to put their empty bottles in a 'yes' or 'no' bin depending on whether they thought the three should quit their jobs to make smoothies. At the end of the festival the 'YES' bin was full, with only three cups in the 'NO' bin, so they went to their work the next day and resigned. After quitting their jobs, the three had a lucky break when Maurice Pinto, a wealthy American businessman, decided to invest £250,000. Innocent credit the creation of their brand identity to David Streek (aka Gravy), the design director at Deepend which also developed their early label designs and website. Prior to the name "innocent", the product was going to be called Fast Tractor. 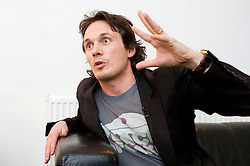 The company's HQ, Fruit Towers, is based in Shepherds Bush. 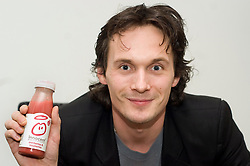 On 2 December 2007 Innocent Drinks appeared at number 40 in the Sunday Times Fast Track 100, a list of the fastest growing private companies in the UK. It was the only company to have appeared in this list for the last five years consecutively. Each of the last four years, Innocent has more than doubled its revenues.